Color blindness isn't just an accusation thrown around when someone believes a dress is blue-and-black where you see white-and-gold. It's a very real condition that can create difficulties in daily life during those moments when discerning color is important, such as cooking or reading charts. Now Google has a new Chrome extension to make the web a friendlier place for people with partial color-blindness. Called Color Enhancer, the new add-on by the Google Accessibility team is a "customizable color filter that applies to all webpages in order to improve color perception," according to Chrome evangelist François Beaufort. If you're living with partial color-blindness and would like to try Color Enhancer, here's how it works. Once you've installed the extension from the Chrome Web Store, click on the icon with three-colored balls that should appear in your browser next to the address bar. If it's not there, type chrome://extensions into your address bar and click the Enabled check box next to the extension. 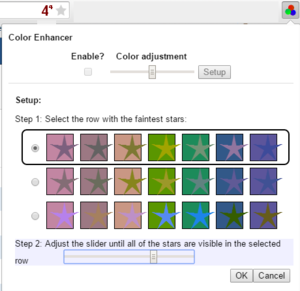 Adjust the stars to help improve color perception on the web with Color Enhancer. Now click on the Color Enhancer icon, and then click Setup in the drop-down menu. You'll see three rows of colored stars. Choose the row that has the faintest stars as you see them. Next, a slider will appear under the stars. Move that slider until all the stars in your row are visible. Once that's done, click OK and the drop down will shrink to its original size. Before you'll see any difference in color you must also click the Enable? check box in the drop down to activate the color filter. You can also use the slider in this window to fine tune the filter to your needs. That's about all there is to Color Enhancer. Hopefully it will help create a better web experience for those who need it.